David Busic, president of Nazarene Theological Seminary in Kansas City, Missouri, was elected as the 40th general superintendent of the Church of the Nazarene on Tuesday, June 25. He was elected on the 21st ballot at the 28th General Assembly and Conventions in Indianapolis, Indiana. Busic then told a story of a young, homeless boy named Bobby living in a Nebraska haystack who, as a physically challenged teenager, found God through the Church of the Nazarene and later gave his life to the church. When Bobby passed away at age 50, people packed the church to remember and honor him. “The reason that story means so much to me is that Bobby was my dad,” he said. “And now you know why I love this church so much. Busic accepted his election as NTS president on September 4, 2011. He is the fourth NTS president elected general superintendent, following , Hugh C. Benner, Eugene Stowe, and William M. Greathouse. Previously, Busic served as senior pastor at Bethany, Oklahoma, First Church of the Nazarene for seven years. He was also senior pastor at Lenexa, Kansas, Central Church of the Nazarene and Livermore, California, Vineyard Community Church of the Nazarene. He was on staff at Shawnee, Kansas, Church of the Nazarene. During his time at Bethany First Church, Busic helped initiate and establish the Swaziland Partnership in 2007 to help reduce the HIV/AIDS rate and to assist vulnerable children in Swaziland, Africa. Busic has been a member of the Church of the Nazarene’s General Board, including serving as president of the USA National Board. He is a graduate of Southern Nazarene University (BA in religion, honorary doctorate) and Nazarene Theological Seminary (MDiv). He is currently pursuing a Doctor of Ministry degree from Fuller Theological Seminary. From 2005 to the present, Busic has served as a member of the Board of General Superintendents’ Thought Partners, a think tank for critical issues facing the Church of the Nazarene. Gustavo A. Crocker, Eurasia regional director, was elected the 41st general superintendent of the Church of the Nazarene Wednesday, June 26. He was elected on the 53rd ballot at the 28th General Assembly in Indianapolis, Indiana. “Your vote is a demonstration that grace exists,” Crocker said after arriving at the podium. A native of San Jeronimo, Guatemala, Crocker is the second general superintendent elected while residing outside the USA/Canada Region, following Eugenio R. Duarte (Cape Verde, Africa) in 2009. 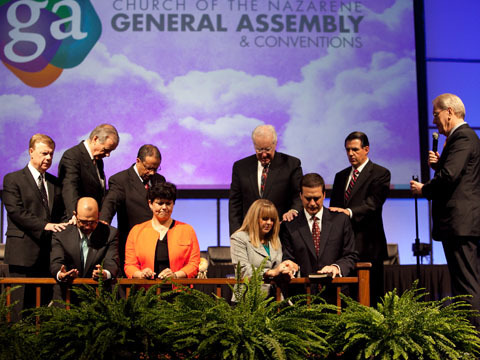 “It’s an expression of our being global and the values that we have in the Church of the Nazarene in the world,” Duarte said following Crocker’s election. “In this way the church has acknowledged the fact that those values are great and that we should use the blessings that God has given us. He has equipped the church with people like Dr. Crocker who love God and love the church and have been in the church and with the church in good and bad times. If good things come to those who wait, the church has received a good thing. The 53 ballots it took to elect Crocker is a record in the Church of the Nazarene, surpassing the 51 ballots it took to elect Stan Toler in 2009. After Ballot 46, Olivet Nazarene University President John Bowling suggested that delegates do three things: 1. Step across aisle to get to know someone to help promote unity, which he felt was fading, 2. Kneel in prayer, 3. Hit the “re-start button” on voting intentions, trying to re-establish authenticity if it was missing. The chair agreed and after the prayer, a feeling of Spirit-given peace filled the room. Before the next ballot was taken, Trevecca Nazarene University President Dan Boone, who was surging in votes at the time, announced that he was withdrawing his name as he felt peace and purpose staying at Trevecca. Prayer was not limited to the Indiana Convention Center as many following the proceedings on Twitter and 1,900 watching on nazarene.org/galive knelt in prayer, too. Tweets began pouring in with Nazarenes saying what state or country they were from and that they were praying. Crocker was elected shortly thereafter. In his speech, Crocker said his mother considered an abortion when she was pregnant with him, but thanks to the teachings of the Church of the Nazarene and her respect for the sanctity of life, she chose to have her eighth child. He said he talked to God like Gideon did, asking him what he, “the youngest of this poor family of the weakest clan of Guatemala,” can do for the Kingdom? After asking the assembly to pray for him, he confessed that earlier he thought about what his answer would be if he was elected. The assembly erupted in applause.